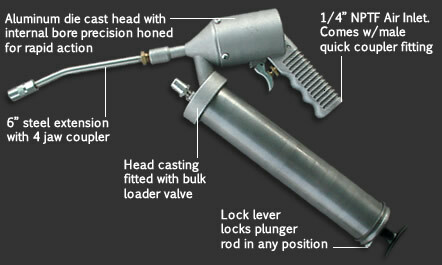 Intermittent Air Operated Grease Gun (pressing trigger provides a "shot" of grease), 6" Rigid Extension with 4 Jaw Coupler with Ball Check. 14 oz. Cartridge Capacity / 16 oz. Bulk Capacity / 1.3 oz per 40 Cycle Grease Delivery / 40:1 Air Pressure Ratio / 4,800 Max. PSI / 1 cfm / 0.026 Cubic Meters Air Compressor Volume. SAE Products® Air Operated Grease Guns offer trouble free air operation with a trigger mechanism that dispenses grease. 40:1 ratio will generate 1,600 to 4,800 PSI discharge pressure. 3-way loader allows cartridge, suction, & bulk loading.